Today, Jeffrey Kane, President of National Distributors and Frank Gaziano's son-in-law announced the winners of the Frank Gaziano High School Scholarships and Awards at a banquet at the Augusta Civic Center. South Portland's Matt Welch and Bonny Eagle's Nathan Martel were named the top high school football offensive and defensive linemen in the state because of their hard work on the field, in the classroom and in their communities. The winners received a trophy and a scholarship of $2,500. All 11 finalists were presented with a commemorative gift to honor Frank Gaziano. Pictured (left to right): Nathan Martel, Gaziano Defensive Lineman Award winner, Jeff Kane, president of National Distributors and Matt Welch, Gaziano Offensive Lineman Award winner. "The event today is what Frank was all about. Congratulations to all 11 finalists. Each of these young men share a tremendous passion for football, their communities and all truly represent Frank's legacy. I know this event today would have made Frank proud," said Jeffrey Kane, President of National Distributors. The scholarship and awards program for Maine high school football linemen was created in memory of Frank J. Gaziano, founder of National Distributors and a former college All American and professional football player with a life-long passion for local sports. Funding for the scholarships was provided by National Distributors. Matt Welch from South Portland and student of South Portland High School is the captain of the school's football and track team. 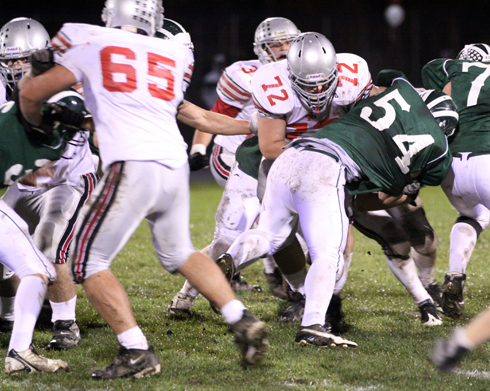 He is a recent winner of the Bill Murphy Lineman Award and was named the Team MVP by the Quarterback Club. Welch, age 18, is a Southern Maine Activities Association (SMAA) Academic All-Star and High Honor Student, ranked 35 of 185 students. In addition to his athletic and academic success, he is also a member of the National Honor Society and World Language Honor Society. The two runners-up for the Offensive Lineman were Zach Dulac from Cheverus and Nicholas Ramsdell from Windham. Nathan Martel of Steep Falls and student at Bonny Eagle High School is a member of the football and baseball teams and has served as the track team captain for the past two years. He is a 2010 All SMAA Conference Selection in football and track. He has a recipient of the Eagle Citizenship Award; the President's Volunteer Service National Award and has been selected as a Hugh O'Brian Youth Leadership Ambassador. Martel, age 17, is a High Honor student and ranks first in his class among 321 students. He is a member of the National Honor Society, French Honor Society, Key Club and serves on the school's student council. The two runners-up for the Defensive Lineman Awards were Christian Durland from Mountain Valley and Chris Desmond from John Bapst. All the finalists were in attendance at the event. The top two runners-up in each category were recognized with a $500 scholarship and each of the selected players received a commemorative plaque. The list of finalists considered for the annual Frank J. Gaziano Memorial Offensive and Defensive Lineman Awards epitomize the character, leadership, and perseverance of Gaziano. The top recipients were selected by the awards committee based on their strong leadership on the field, in the classroom, and in the community. All eligible applicants must have been a high school senior in 2010, competed at the varsity level for a minimum of two years and have an exemplary record of positive athletic and non-athletic citizenship. As part of the selection process, the students submitted an essay and game film featuring the each linemen against his toughest competition. Applicants from all levels of Maine's high school football three-class system were eligible for the scholarship and able to be nominated by their coaches. For more information on the 2012 banquet or the scholarship program application process or to contribute to the scholarship fund, visit www.gazianolinemanawards.org or contact the Frank J. Gaziano Lineman Awards Board of Directors at (207) 773-1719, ext 3303.